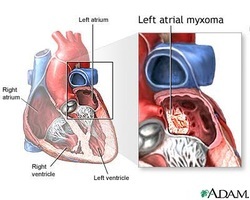 There are two form of cardiac tumors / cardiac neoplasm known as rhabdomyomas and myxomas. Myxomas may present as pedunculated form in the left atrium near the fossa ovalis. Myxomas may consists of smooth muscle cells and globular myxoma cells in a mucopolysaccharide ground substance. Generally, myxoma may present with malaise, arthralgia anemia and fever. Besides that, myxoma is benign growth which may present with syncope and dyspnea. These symptoms are commonly due to ball valve obstruction which lead to impairment of the function of the mitral valve. ,Myxomas may also lead to stroke due to embolus and the present of valvular regurgitation murmur. Myoxma is part of autosomal dominant disorder which affect the adult. Rhabdomyoma is another form of cardiac neoplasm which may present with obstruction of the heart chamber. Rhabdomyoma may present with gray myocardial mass which protrude into the ventricles. The gray myocardial mass will consists of spider cells. Spider cells are polygonal cells and glycogen laden vacuole which is devided by strands of cytoplasm. Rhabdomyoma may affect young children and infants and commonly associated with tuberous sclerosis. 1.Reynen, Klaus. "Cardiac myxomas." New England Journal of Medicine 333.24 (1995): 1610-1617. 2.Fenoglio Jr, John J., Hugh A. Mcallister Jr, and Victor J. Ferrans. "Cardiac rhabdomyoma: a clinicopathologic and electron microscopic study." The American journal of cardiology 38.2 (1976): 241-251.